The other popular nursery rhyme that’s set to this tune is Baa Baa Black Sheep! Have you ever noticed that Twinkle Twinkle Little Star and The Alphabet Song have the same tune? There’s another popular nursery rhyme that’s set to this tune—guess which one it is! Build vocabulary by playing a guessing game with your child’s toys. If you give some descriptive clues, can your child guess what toy it is? Help your child make artistic labels for things in his or her bedroom. Encourage your child to write or trace the first letter for each object. Dr. Palacios holds a PhD in Curriculum and Instruction as well as National Board Certification as an Early Childhood Generalist and has more than 25 years of experience in early childhood education. 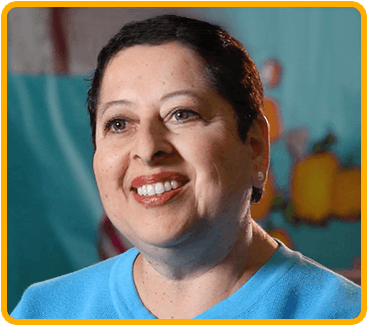 She is a pioneer in the field of dual-language learning and assists in strategic curriculum planning for ABCmouse.com, ensuring that all content and activities are age appropriate and reflect best practices in early childhood education. Dr. Palacios was recently interviewed about the role parents play as their child’s first teacher. Dr. Palacios: Children begin learning from the moment they are born—everything they see, hear, and touch is actually a learning experience. These experiences form the foundation for learning language, for learning about how the world works, for learning how people work and play together, for learning how to control one’s own body—for all kinds of learning. You can think of each of the experiences as a lesson. And even though they don’t plan these lessons in the same way that teachers plan lessons for their students, parents create the environments and experiences in which learning happens, which makes them the first teachers their children will ever have. So environment is an important aspect of learning? Dr. Palacios: Environment is tremendously important, because young children learn primarily by looking, listening, and exploring in their environments. 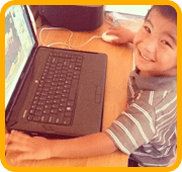 A lot of that learning will occur naturally, but parents can also help it along. How can parents help their children learn from the environments they’re in? Dr. Palacios: For one thing, every environment and experience provides an opportunity to develop a child’s language skills, whether it’s just talking about what’s in their room, discussing their daily routine, or talking about what they’re having for dinner. A child’s vocabulary will expand as parents introduce new vocabulary. And there are so many other teachable moments, such as a bird flying by, the dog barking, or the cat shedding. Can you give us a few more examples of teachable moments? Dr. Palacios: Pointing out and asking your child questions about changes in the weather, leaves falling, or snow on the ground that wasn’t there before—these are all examples of teachable moments. I have a grandson who loves to count fire hydrants. So while we’re walking and counting, I take the opportunity to ask him if he knows what a fire hydrant does, why they’re there, or why a firefighter needs them. Teachable moments come from the child’s own observations or from things they’re interested in, because they’re so excited and curious to learn more. It can be hard when parents are working and have busy lives, but teachable moments can be just a few minutes or even a few seconds. The trick is to be aware that the things that we see and do as we go through our days may seem mundane to us, but to our children they are wonders. 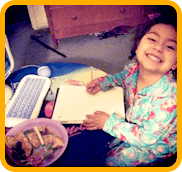 What are some other ways that parents can help their children learn? Dr. Palacios: Of course physical development is also important, and that starts at birth. For example, you can help a baby improve his or her ability to track motion by holding an object in front of the baby and moving the object from side to side and up and down, or by playing peek-a-boo. As children start to crawl or walk, it’s a good idea to give them something to move toward, such as Mom or Dad or a small toy, and also to praise them by clapping and encouraging them to keep going. And once a child is mobile, they should have lots of time to engage in physical activities, like playing outdoor games or moving to music. Playing catch also has great benefits because it helps the child develop eye-hand coordination. There are also many great indoor activities that will develop physical skills. Cutting things out with safety scissors helps develop coordination and fine motor skills. Measuring ingredients for cooking has the same benefits. Learning to use a computer mouse also develops motor skills and eye-hand coordination, and we have been hearing at ABCmouse.com that with a little practice even toddlers can master this skill. Should parents also teach their children about the alphabet and numbers? Dr. Palacios: Well, it’s true that the more prepared children are when they enter school, the better. But it’s even more important that children experience learning as something they like doing, so if parents want to teach their children academic skills, then it should be done in a fashion that the child really enjoys. There are a lot of ways to make learning fun; I like to encourage parents to take an approach that is called integrated learning. What is meant by integrated learning? Dr. Palacios: Integrated learning occurs when parents encourage learning in a number of subject areas while focusing on one topic. For example, when teaching about fruits and vegetables, a parent can use both the home and grocery store as resources. Parents can provide wonderful language-building opportunities by talking to their child about the fruits and vegetables they see at the store. They can discuss geography and the parts of the world where fruits and vegetables are grown and shipped from. Back at home, parents can integrate other skills while cooking together. For example, when cooking dishes with the vegetables, children will have opportunities for measuring and sorting and for using their senses to help them describe the ingredients they’re using. And reading and writing skills can be added into the mix by having the child make labels for the containers or bins that the fruits and vegetables are kept in. You’ve mentioned language skills a few times. Can you talk a little more about how parents can help support language development? Dr. Palacios: Oral language experiences are crucial to children’s reading success, understanding of spoken words, and enrichment of their knowledge. Young children are very curious about the world around them. Talk to your child and answer questions about the things that are present in his or her environment. Language experiences that include touching, smelling, hearing, tasting, and seeing will help your child remember the language he or she has heard because it is connected to one of your child’s senses. These language experiences also set the stage for important reading skills, like recalling, comprehending, classifying, sequencing, and retelling stories. Stories are wonderful vehicles for introducing children to new worlds, but so are nonfiction books that show children the rich variety and wonders of the real world. What is the importance of providing access to books? Dr. Palacios: When we provide children the gift of books and language, we are providing them with imaginative experiences that are important in building a nation of creative thinkers and innovators. These books should be fiction as well as nonfiction books. Always have books on hand in the car, in the kitchen, in the child’s bedroom, and even outside to invite children to read on the porch or under a tree. 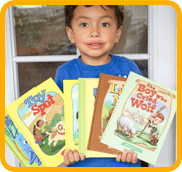 Whether books are checked out of the library or bought at the market or a bookstore, good children’s literature provides the rich language needed for children to be successful in school. Books can be selected based on a child’s interest, especially if he or she is a reluctant reader, or they can be selected based on what’s currently happening in a child’s life: foods, clothing, cooking, insects, weather—the list is endless! Dr. Palacios: Children learn best when routines and daily schedules have been established. Along with providing opportunities to learn about order, sequencing, and concepts of time, children also learn that routines allow for responsibility, decision making, and sharing. Established routines make for smoother transitions and help children to prepare mentally for the day and what is to come, while providing frameworks in which creative learning can occur. And remember, you don’t have to buy expensive toys to have a creative learning environment at home—the most important ingredient is your own imagination. Your love and your time are the greatest gifts you can give your child. Finally, what advice do you have for parents whose children are enrolled in a formal school setting, but who want to remain involved in their child’s learning? Dr. Palacios: I believe all parents should play an active role in their child’s learning by participating in activities the school conducts and also by providing support at home. If, as a parent, you don’t understand something a teacher sends home, or you aren’t sure how to best support your child, be sure to talk to your child’s teacher about it. It’s also a good idea to develop a relationship with the school’s principal, who may be in a position to access additional resources, if that’s ever needed. Always remember: even when you are no longer your child’s main teacher, you will always be your child’s FIRST teacher, and your child’s most important advocate.